In this HUGE travel guide we’ve got all the websites you need to find all-inclusive, full/half board or self-catering packages. We’ve picked out the best tour operators for families and share tips on avoiding school holiday price hikes and more. Get ready to find yourself a cheap package holiday for 2019/2020! Brexit-Am I OK to book a holiday in the EU? What can you expect from an ‘all-inclusive’? Can you avoid the school summer holiday price hike? You should ALWAYS get travel insurance, even in Europe. But not from your agent! Do you need airport parking? Cheap package holidays are back in fashion. Nearly half of all UK holidaymakers will take a package holiday in the next 12 months. After a slump in 1990s and early 2000s, the cheap package holiday bounced back this decade with the rise of the value-busting all-inclusive. Sun, sea, kids’ activities, free entertainment and as much food and drink as you can manage – what’s not to like? But this is the internet age when people are saving money online by ‘cutting out the middleman’ and organising themselves with the help of consumer-friendly websites and apps. So are package holidays still a good deal? And when does it make sense to choose one over an independently-organised trip? When you want to be picked up from the airport and dropped at the beach as soon as possible – without having to think about food shopping or haggling for taxis. If this sounds like you, get searching for a bargain package. 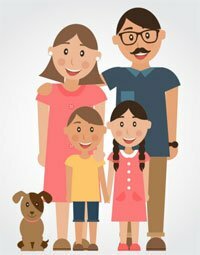 There’s a lot to choose from and, if you use our tips, you can have lots of fun in the sun while saving yourself a small fortune. Anyone earning the average UK wage can buy a seven-day Mediterranean holiday for a week’s pay…You will fly from a convenient airport on a state-of-the-art charter aircraft, enjoying food and entertainment of higher quality than you would find on most scheduled airlines. Book early. Really early – you will save a lot of money. If you want to go away in the Summer, you should be looking from December. If you leave it as late February to start looking, you are reducing your options and facing raised prices. Because package holidays are all about availability. When holidays are first advertised tour operators want to make some sales, so prices are attractive. As airline seats and hotel rooms start filling up, prices increase. You need to be buying in those early weeks of sale – ideally at LEAST eight months before you plan to travel. If you’ve left it too late to grab a bargain then your best bet may be to hold tight for late deals. As long as you’re flexible on destinations and happy to not know where you are going until a few weeks before, you could pick up a cheap package holiday from four weeks before departure.. The comparison sites, travel agents and tour operators we list below all highlight late deals. You could also try the likes of lastminute.com. All-inclusive package holidays can provide a LOT of value. Some things to be aware of: Alcoholic drinks may be limited to certain (local) brands – don’t expect Dom Perignon on tap. Beer may not be included. Some ‘free’ activities may have extra charges for equipment hire (for example scuba-diving). And you may still want to tip waiters, perhaps at the end of the holiday. Also, if you’ve never gone all-inclusive before, many people say they feel obliged to eat and drink excessively to get their money’s worth – but they end up feeling bloated and fed up. There’s no need to go mad! You can easily get your money’s worth without stuffing your belly. Have a think about whether you’ll want to eat in the same place every day and about how much you might spend at restaurants or on self-catering. Then decide if all-inclusive is good for you. It’s a frustrating fact of life for families with school-age children. As soon as school’s out for the summer, the cost of holidays goes up. The Guardian did an interesting study last year to find out the true extent of the price hikes by travel firms. It compared prices in two summer weeks that were close to each other – one in July term-time and one in July/August school holiday time. Looking at 11 different firms, it actually found quite a contrast. Euro holidays from First Choice, Mark Warner and TUI saw some of the smallest inflations of between 21% and 28%. Still, on a £1500 holiday that would represent at least £300 more outside of term. Meanwhile it was the British-based holidays that saw the steepest rises, with Butlin’s and Centre Parcs going up 99% and 51% respectively. Depart and return on a midweek day as these are cheaper. Check our guide to all the companies that offer child free places. Considering most holidays are charged on a ‘per person’ basis, you can save a lot of money by getting the kids in free. Many tour operators now offer free places for kids. These are often restricted to certain resorts and holiday types – and they sell out early too. Try Jet2holidays, TUI and First Choice who all promote their ‘kids go free’ offers. Be aware that often these deals only apply to ONE of your children. So if you’re taking a family of three kids away, you’ll still have to pay for two of them. Travel agent On The Beach gives you a price per adult, with kids going free in most hotels. If you’re in a hurry and don’t want to plough through all these sites, our recommendation for a basic cheap package holiday search is to pick 1 x comparison site, 2 x travel agents and 2 x tour operators from the list below. There are some great comparison sites for car hire, flights and hotels. But when it comes to package holidays, no-one has yet come up with a brilliant search engine. Still, here’s three that are worth including in any holiday search. The most popular comparison site. Choose your destination, date and your family size and you’ll be shown a range of different deals from various agents. You can then filter the deals by star rating, guest review and all-inclusive to name a few. Once you’ve typed in your destination and dates you’ll be shown all the relevant agents rather than specific deals. Dealchecker then send you to their sites to find a hotel. Seems basic, but it’s useful for getting an overview of which agents operate at different resorts. Kayak pulls together flight + hotels to create holiday packages, with lots of Expedia deals featured. It’s strength is longer haul destinations like Thailand and Morocco or cities. Check out its curated vacations page. Travel agents and brokers are ‘middle men’. Whereas tour operators create package holidays by bringing together flights, hotels and airport transfers, travel agents only sell them. And they all sell them at different prices. This means that a holiday you see on one site for £800 might be found on another site for £700. Confusingly, some travel agents are also tour operators! Some travel agents we show here will give you an online price but you have to CALL them to confirm the booking. This means you can try haggling the price (see below). Finds deals from a very wide range of tour operators. Gives you an inclusive price that includes return flights, flight taxes, cabin baggage and booking fees. Check the hotel reviews on TripAdvisor for a better idea of standards. Very good site – definitely one to check for the popular destinations like Spain, Portugal and Greece. Agent that works with Thomson, Thomas Cook and First Choice. Has a highlighted All Inclusive section with deals by destination. Good transparency by showing TripAdvisor reviews alongside hotels. A popular choice, scoring 8.5/10 on Trustpilot, loveholidays.com has some great filters. You can compare costs across airports and destinations and you can do an open search that leaves everything flexible. Using that we managed to find a week family stay in April in Ibiza at a 4 star-rated (TripAdvisor) hostel for just £420! A different approach. With On The Beach you build your own package holiday step-by-step, using their site to choose your flight, then your hotel, and then your airport bus or taxi. It’s got a pick-n-mix appeal and produces some attractive final prices. Despite using a combination of different companies, the whole package is ATOL protected. Like On The Beach, Expedia’s offering is build-your-own. Use the website’s search filters to look for things like kids’ clubs and all-inclusive. Use Travel Republic to compare what you found on On The Beach and Expedia. Like a lot of sites they offer a price match promise – if you see the same holiday cheaper within 24 hours of booking they’ll refund the difference. Potentially, since many operators own airlines, you could find your best deals here. Agents will often refuse to match a tour operator’s price because they can’t compete. Still many people’s instant choice, it retains a trusted reputation with a 92% customer score on Feefo. An easy-to-use website and deals from all operators, not just its own. Thomas Cook had some bargain summer 2016 packages for Greece and Turkey when we looked but is great for traditional destinations like Spain. Has boldly gone after the all-inclusive holidaymaker – that’s the only kind of deal they now offer. All their getaways include flights, accommodation, transfers, three meals a day and local drinks as standard. Voted ‘Best Large All Inclusive Holiday Company’ at the British Travel Awards, and 94% of customers rate their breaks ‘good’ or ‘excellent’. Owns Holiday Villages and SplashWorld for families. One for long haul destinations like the US, Caribbean, Mexico and Asia. If you’re looking at an all-inclusive package to Florida for Disney, take a look at their Disney Deals. Long-established Olympic specialises in Greece and Cyprus but also covers Turkey, Croatia and some of Spain. Jet2holidays from out from 7 UK airports that make them popular with holidaymakers from the North: Leeds Bradford, Manchester, Newcastle, Belfast International, Edinburgh, East Midlands and Glasgow. You can put a deposit down and pay later. Aimed at the mid-range market and very popular with active families. Voted Best Family Tour Operator at last year’s British Travel Awards. Its summer holiday resorts in Greece, Turkey, Sardinia and Corsica promise sandy beaches, watersports and tennis tuition, mountain bike loan, spas and childcare. Also big on skiing. At the luxury end, if you’re after the posh Med experience or perhaps a safari package or holiday-of-a-lifetime to the Maldives, Kuoni will take your in style. Flights are often with quality names like BA. One to check out if looking for 5-star hotels and high quality dining. Using some of the websites above, you may be able to haggle yourself a bottom-line bargain. Go to a site like Icelolly.com, TravelSuperMarket or Teletext Holidays and find a holiday you like. Note down the flight details, hotel and any other factors that may influence the price, like all-inclusive or bed and breakfast. Note down the tour operator that’s providing the holiday. Now Google the tour operator and find their direct booking website. For example, you’d discover that Sunsave uses a website called bargainlateholidays.com to sell its packages. See what price it is suggesting for the same deal. You could also check out the cost of separate flights and direct hotel bookings, as long as you’re comparing exactly the same. Finally phone some of the travel agents listed above. Detail the cheapest price you’ve found for the package and ask them if they can go any lower. Check out Groupon’s Getaways page, Living Social’s Escapes and Wowcher’s Travel Deals. These daily deal sites usually have time-limited offers on family holidays and beach getaways. They’re more effective when you’re after a late deal because their offers are often unsold inventory that the tour operator is keen to avoid a loss on. Some high end hotels don’t advertise discounts, because it’s bad for their premium image. Yet they’re as eager for business as every other hotel in the game. Instead they make their deals anonymous using sites like lastminute.com Top Secret Hotels, Secret Escapes and Super Break Mystery Hotels. If you see a hotel described but not named on one of these sites, with a bit of investigative work you should be able to work it out. Cut-and-paste some of the holiday description into Google to identify which hotel is involved in the secret holiday deal. You won’t find the cheapest package holidays on these sites. But you will find holidays that include hotels that would normally be impossible to book at such discounted rates. If none of the websites you’ve used so far have proved themselves, try creating your own package. Pick your destination. Use a flight comparison site like Skyscanner to find flights. Use a hotel finder like Booking.com or Hotels.com to search hotels. And you can even use Hoppa to sort your airport transfer. For more advice on flights and hotels, check our other travel guides. While booking your holiday with a travel agent or tour operator, you’ll be offered travel insurance. Say no, because it’s almost definitely cheaper to buy it independently. Make sure you do buy the insurance though – we have a guide to travel insurance. And while UK residents are medically covered in Europe by the EHIC card, it doesn’t cover everything. For example, if you needed to be airlifted you would face hefty costs. Plus it only cover your health: crime, cancellation and baggage loss are some other holiday risks to protect against. If you don’t know where to start, read our packed guide that tells you how to get cheap and comprehensive holiday travel insurance. Remember to factor airline charges that you may face, like checked in baggage. Many operators will sting you for extras here. TUI‘s checked baggage fee is from £13, and easyJet‘s £37. Charges for carrying an item of overweight hand baggage is £30 to £40 on Flybe. Ryanair has the highest charges for checked luggage from £40. Thomas Cook charges for sports equipment (up to £70 for some items) and has a charge of up to £70 for overweight hand luggage. All this has to be included when you weigh up the best deal. Like travel insurance, if you need car hire with your package holiday it’s probably cheaper to organise it yourself. Take a look at our guide to car hire. It includes over 30 tips to help you find reliable cover, with advice on making claims, a list of the most trusted insurers and a warning on the small-print pitfalls to watch out for. If you’re taking your car to the airport, which is often the cheaper and more convenient option for families, you’ll need to pay for airport parking. Again, the key to saving money is quick action. Don’t wait – start looking for the best deals as soon as you book your flight. Holiday Extras is the best known airport parking comparison site. Simple to use, it provides quotes from a good range of car park operators. Also worth checking is Skypark, which claims the lowest prices and has more ‘meet and greet’ style offers than others. Another to try is Looking4Parking. 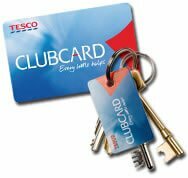 You can use loyalty scheme vouchers such as Tesco Clubcard towards your holiday. Nectar points can be exchanged with Expedia, Easyjet and TUI. If you use cashback sites like Quidco or TopCashBack you could knock some more money off your package holiday. Quidco offers savings with dozens of big travel firms, including Thomas Cook and First Choice to name just two. 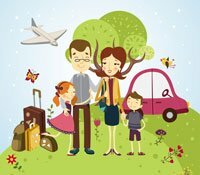 TopCashBack has a similarly big list of holiday websites, including loveholidays.com and Thomson. If you’re not sure what cashback is, it’s worth spending some time researching. While the idea seems strange at first, even consumer charity Which? has recommended using them in a recent report. We’ve found cashback websites can save hundreds of pounds off the cost. However don’t just look at cashback sites because, as always, it can pay to shop around. Credit card payments can provide welcome extra protection on your holiday. So long as you’re spending more than £100, your credit card purchase is protected by law and – should anything go wrong, like the tour company going bankrupt – you can claim your money back. However, your package holiday will likely be protected anyway by the ATOL scheme (look for the ATOL logo when you book) AND you should definitely be taking travel insurance which should cover cancellations. 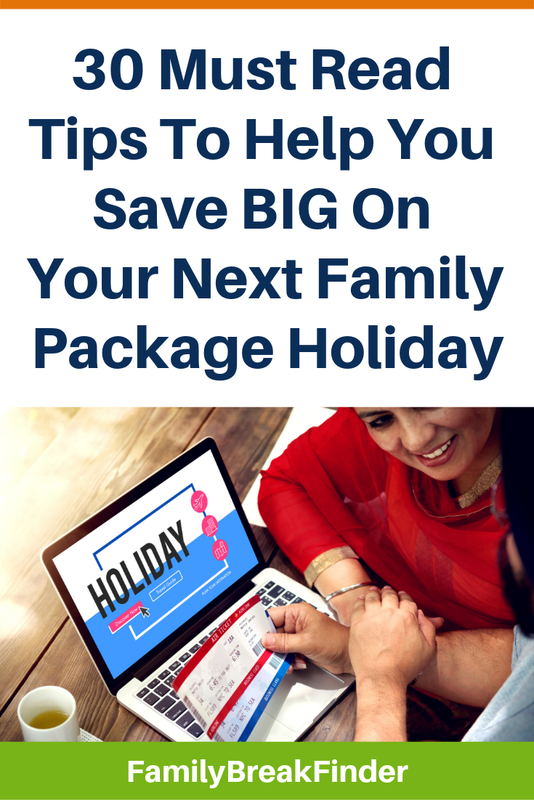 What you need to watch out for are credit card fees when you book your package holiday. Because some firms charge up to 3 per cent, and that can amount to another £50-100 on your booking. Try to use your debit card instead – or look for firms that don’t charge credit card fees. Travelling by train to the airport? Watch out for expensive airport train services like the Heathrow Express and Gatwick Express. Go by Tube to Heathrow or take a standard Southern train to Gatwick (only 5 mins longer) and a family of four will save at least £40. Read our detailed guide to cheap train tickets for loads more tips. Exchange rates are the worst at airports. You don’t want to squander the time you’ve put in saving money on a cheap package holiday by wasting £50 or more on a terrible airport currency deal. Instead buy your currency online. Use a site like MoneySupermarket to see who’s offering the best rates. These bureaux will send your money through the post by secure delivery. It’s the cheapest way to buy travel money. When you’re travelling abroad with your smartphone, if you leave your data switched on your phone will automatically connect to one of the country’s own phone networks. And that could lead to expensive charges as emails and social media updates come in – not to mention inflated costs to make calls and send texts. Most tourist hotels and cafes now provide free wifi. Our best advice is to switch your data off entirely while you are away and use wifi to stay in touch. Install an internet phone app like Skype or Viper or use WhatsApp to make calls. If you think wifi will be an issue, make sure you check out you phone provider’s advice on roaming charges. Some like you to notify them before you go abroad and they will provide reasonable data packs you can use. This could come in handy if you’re hiring a car and using your phone as a sat nav.